In Amos 9:13, the prophet is describing a future situation when the harvest will be so abundant that reapers will not have time to complete the harvest before planting time starts again. Put differently, the harvest will be continuous—the harvest still will be in process when the time to plant seed arrives. This harvest will be so abundant that the juice from the harvested grapes will drip and flow from the mountains and hills. The time when these imagistic supernatural blessings literally will take place is determined by the preceding verses of Amos 9:11-12. Clearly, in Amos 9:11-12 the prophet is prophesying about future blessings that begin to be realized at the time of Jesus the Christ’s First Coming. There can be no doubt that these future blessings refer to the setting up of the Kingdom of God (the establishment of the Lord’s ekklesia, those believers who have entered into the Kingdom of God on Earth), which includes the first Jewish converts and those early Gentiles to whom these initial Jewish converts take the Lord’s Gospel. During the first century A.D., the Gospel went out to the Gentiles, and for nearly two thousand years this same Gospel has continued to go out to the Gentiles and the Jews. For this reason, it also should be obvious that these blessings that the prophet Amos speaks about in verse 13 additionally pertain to the time when the Kingdom of God would flourish as never before, growing even faster and larger than the growth that came as a result of the first-century believers’ effective witnessing (cf. Amos 9:14-15; Acts chapters 2-4). In other words, these blessings also pertain to both the conversion and the return of God’s chosen Jewish people to their homeland, where they will occupy the Promised Land forever and ever (cf. Amos 9:11-12; Joel 3:20). In essence, Amos 9:13 is about the time when believers will begin to see the supernatural convergence of the former and latter rains—the time when, as Habakkuk prophesies, both Jews and Gentiles will affect the whole world. The prophet Habakkuk writes: “For the earth will be filled with the knowledge of the glory of the LORD, as the waters cover the sea” (Habakkuk 2:14, ESV; cf. Isaiah 11:9; Joel 2:23-25, 28-29). Thus, in order for the Earth to be “…filled with the knowledge of the glory of the LORD, as the waters cover the sea,” the Earth first would have to be filled with the Holy Spirit-the Living Water who also is the purifying FIRE of God. Indeed, once the promised Holy Spirit has succeeded in baptizing (infilling) believers with the FIRE, which means they are filled with the supernatural dunamis power and fullness of God (cf. Ephesians 3:16-19), these Holy Spirit-filled believers are then able to propagate this “…knowledge of the glory of the LORD…” throughout this world, via the preached Gospel and by the lifestyle they lived. Furthermore, this filling of the Earth “…with the knowledge of the glory of the LORD…” is prophesied to happen after the convergence of Messianic Jews and Gentiles manifests one body of believers who, as a result of the former and latter rains’ outpouring, flow together in the dunamis power and the fullness of God. That is to say, born again and saved Jewish and Gentile believers in Christ Jesus both receive the indwelling Holy Spirit at the moment they receive their salvation. The indwelling Holy Spirit is the One who makes it possible for these believers to access God’s supernatural dunamis power through the Holy Spirit’s unique infilling. This supernatural dunamis power primarily is for the purpose of witnessing for Christ Jesus (cf. Acts 1:8), but also this supernatural dunamis power is for the preaching of the Gospel (cf. Acts 4:31), living a holy life (cf. 1 Peter 1:14-16), and having a deeper devotion to God (cf. Deuteronomy 6:5; Matthew 22:37-40; Mark 12:30-31; Luke 10:27). Thus, the Baptism of the Holy Spirit with FIRE is a “secondary” experience of the Holy Spirit that happens after believers receive salvation (justification). This Holy Spirit baptism is similar to the water baptism analogy, because it involves being covered with, immersed in, and empowered by the Holy Spirit. Instead of water, the Holy Spirit immerses believers with Himself. He covers believers with Himself. That is why it is the infilling of the Holy Spirit (the Baptism of the Holy Spirit with FIRE) that, when born again and saved believers allow Him to immerse them in Him, He then endues (clothes . . . covers them completely with) God’s supernatural dunamis power, endows them with God’s spiritual gifts, and then burns like purifying FIRE so as to cleanse (sanctify or purify), enlighten, and rejuvenate their soul, by penetrating every part, until their whole soul is in harmony with the image of the glory of the Lord (cf. Luke 3:16; Matthew 3:11; see also Acts 2:3-4) so that they authentically and effectively can witness for Christ! Now, according to the apostle Paul, “…in one Spirit we were all baptized into one body—Jews or Greeks, slaves or free—and all were made to drink of one Spirit” (1 Corinthians 12:13, ESV; blue lettering is this blogger’s emphasis). Therefore, being baptized with the Holy Spirit and FIRE (cf. Matthew 3:11) depends on whether or not a believer has an intimate, loving, caring, willing, and obedient relationship with God. This intimate relationship will determine if that believer also has yielded to the mighty workings of the Holy Spirit. In other words, when a believer is baptized with the Holy Spirit and FIRE, there will be visible external secondary evidence that supports the power of the infilling Holy Spirit. The difference between the primary visible external evidence of alcohol intoxicated people and the visible external secondary evidence of Holy Spirit-filled believers is that the visible external secondary evidence that supports the power of the infilling Holy Spirit flows out of believers ONLY when the surrendered believers are allowing the Holy Spirit to work through them so that God can use them to minister to others—so that Spirit-filled believers are voluntarily and obediently doing the Perfect Will of God (producing much fruit, a great harvest, for the Kingdom). Put differently, becoming spiritual winos means that instead of being controlled by an alcoholic wine, which produces external signs like slurred speech; foul language; off-color jokes; excessive flirtatiousness; glassy, unfocused eyes; forgetting thoughts in mid-sentence; stumbling; swaying; having depth perception problems; dropping things repeatedly; or having a hard time picking things up, spiritual winos are controlled by the power and FIRE of the Holy Spirit who influences their godly talk, walk, and movement. As the apostle Paul says, it is in the One, True, God, whose Spirit is controlling surrendered believers, that believers ‘…live and move and have [their] being’(cf. Acts 17:28, ESV; inserted bracketed word is this blogger’s emphasis). Where being spiritual winos is concerned, it should be obvious that Paul is making an important point in Ephesians 5:18, when he presents a contrast between being “drunk” or filled with the Holy Spirit and being “drunk” or filled with wine. His point is that both of these “drunk” individuals, alcohol intoxicated people and Spirit intoxicated people, are controlled—that alcohol controls the former, and the Holy Spirit controls the latter. Indeed, Paul’s contrast makes it clear that unlike the power of wine, which is only evident when we see the external actions of people who have become intoxicated from alcohol, the infilling power of the Holy Spirit is evident in our internal spiritual relationship with God, Jesus the Christ, and the Holy Spirit AND in our external physical and spiritual deeds that we do for Christ. Paul’s point also is that the external actions of “drunk” individuals become the primary evidence that supports the power of the imbibed alcohol. However, even though for people who are “drunk” with the power of the Holy Spirit there also is external evidence, this visible outward evidence is merely the secondary evidence that proves believers INTERNALLY have been indwelt and subsequently infilled by the Holy Spirit. Put differently, the indwelling of the Holy Spirit establishes an internal relationship between the Holy Spirit, God, Jesus the Christ, and the person whom the Holy Spirit has indwelt, but, unlike with alcohol, the primary evidence that supports the dunamis power of the Holy Spirit’s Baptism (infilling) is the external evidence that flows as a result of the infilled believer’s internal relationship. This internal evidence that flows outwardly largely is the infilled believer’s modeling of the character and lifestyle of Jesus the Christ. Since it is the mighty workings of the Holy Spirit that causes filled men and women to produce good fruit from the sown good seed (Gospel; Word of God) that has been sown into good ground (a reborn human spirit), the obvious conclusion is that today’s institutional (organizational) “church” HAS NO WINE! If the institutional (organizational) “church” HAS NO WINE, then it stands to reason that there are not as many truly born again and saved believers as today’s institutional (organizational) “church” would have the world to believe, and/or there really are not very many Holy Spirit-filled believers. One of the reasons why there are not so many Holy Spirit-filled believers is because the Holy Spirit has been quenched (humans—pastors, other spiritual leaders, and “church” members/pew sitters—have extinguished the Holy Spirit’s influences in their hearts; His FIRE has been put out; see 1 Thessalonians 5:19). For the above reasons, a revisiting of the Cana Wedding Feast is vital, because the New Wine that the Lord provides has a deeper symbolic meaning. In fact, as far back as the ancient Hebrew prophets, new wine has been a symbol of God’s refreshing Holy Spirit, and a sign of God’s blessing and abundance (cf. Joshua 9:12-14; Job 32:18-20; Isaiah 65:8; Ezekiel 17:6; Hosea 4:10-12; Haggai 1:10-12). That is why Mary’s words spoken to her son, during the Wedding Feast at Cana, also have a deeper symbolic meaning. Mary tells Christ Jesus: “…They have no wine” (John 2:3b, ESV). To Christ Jesus, who is the prophesied Messiah, these words’ deeper symbolic meaning is: They need the wine of the Holy Spirit! Indeed, that they did not have the wine of the Holy Spirit is why the Lord’s response to His mother is that His hour had not yet come (cf. John 2:4b). For sure, He needed to be crucified (to die), to be buried, to be resurrected, and to have ascended back into Heaven before the Holy Spirit could fill this Earth and believers in Christ. Be that as it may, Christ Jesus still performs the miracle of turning water into wine. However, the real meaning behind this miracle is understood when the master of the Wedding Feast says to Christ Jesus, “…you have kept the good wine until now” (John 2:10b, ESV; cf. Luke 5:39). His words also have a deeper symbolic meaning, because, to Christ Jesus, the master of the Wedding Feast is proclaiming that the true Messiah has come! Without doubt, Christ Jesus’ turning water into wine is a picture of the Divine Bridegroom who provides the wine of the Holy Spirit during the betrothal contract (covenant) negotiations with His Bride. That’s why it is no coincidence that the miracle of turning water into wine precedes the Holy Spirit transforming the life-sustaining waters of the Rock of salvation into His dynamic wine—His supernatural influence! That also is why the Bride’s Bridegroom, Jesus the Christ, describes the new work of God, which is symbolized by the ministry of the Holy Spirit, as new wine that cannot be put into old wineskins, for the dried-out leather of the old wineskins has lost its flexibility. So, when the fermentation process of the new wine requires the old wineskins to be flexible, the result will be ruptured or cracked wineskins. The point here is that for believers to walk with God in the newness of life—the newness of the holy work His Spirit is doing within them daily—their personal lives and their beliefs in religious dogma must be flexible. Believers, thus, cannot be more focused on being in control of their own lives and more focused on hanging on to their traditional beliefs, which may or may not be in error, than they are focused on walking in the newness of life—walking in the newness of the Holy Spirit’s mighty workings. Jesus the Christ has incorporated the prevailing knowledge of winemaking that was available in His culture to illustrate the point about the incompatibility of the old Jewish religious system with the new message of the Kingdom of God. 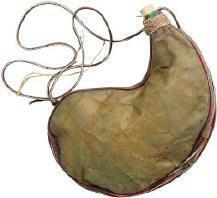 Traditionally, the Jewish people emptied their old wineskins and then saved them for the next year. Over the course of time, these old wineskins became dry and brittle, but instead of throwing away the dry and brittle wineskins and making new ones, the old wineskins were “reconditioned” by soaking them in water for a few days. Then, when they softened, they were coated with olive oil and were ready to be used again. The wineskins now were able to stretch so that they could accommodate the expansion of gases that were a result of the fermentation process. The above analogy is clear. Born again, saved, and being sanctified believers are old wineskins that have been “reconditioned” by their old hearts’ regeneration (new birth), by water baptism (immersion in water as an outward sign of their profession of faith), by the oil of the indwelling Holy Spirit, and by their faith in the Word of God, which make the soul soft and pliable. However, before these believers are completely ready to stretch so that they can accommodate all of the Holy Spirit’s revelations and new truths about the Kingdom of God on Earth, as well as the Holy Spirit’s entire ministry (the fermentation process), these believers willingly have to surrender their desires to control their own lives to the infilling of the Holy Spirit. Additionally, these believers willingly have to surrender their loyalties to the traditions of men and women to the infilling of the Holy Spirit. Their surrender is what makes it possible for them to have the necessary room it takes to receive the Holy Spirit’s revelations and new truths about the Kingdom of God on Earth, as well as the Holy Spirit’s entire ministry (the fermentation process). The last reason why the modern-day institutional (organizational) “church” is suffering from spiritual sobriety is because, since the infilling of the Holy Spirit is accompanied by the speaking in tongues, today’s institutional (organizational) “church” has placed more emphasis on the speaking in tongues supernatural phenomenon (either arguing for it or against speaking in tongues), instead of focusing on the main purpose for Baptism of the Holy Spirit with FIRE. It should be noted here that just because some people have counterfeited tongues, or just because some believers who speak in tongues also, with their natural tongues, have told lies, none of that means that speaking in tongues IS NOT a genuine sign of being filled with the Holy Spirit. The real truth is that there is nothing about God, Christ Jesus, or the Holy Spirit that hasn’t been, or that will not be, counterfeited. That is why the Word of God tells believers that they need spiritual discernment, which is a special gift of the Holy Spirit! However, while the New Testament Scriptures, more often than not, point to the speaking in tongues as being the most commonly repeated biblical evidence that proved the early first-century believers were full of the Holy Spirit (Baptized with the Holy Spirit and FIRE), as earlier mentioned, the Scriptures also point out that the main reason why believers need to receive the Baptism of the Holy Spirit with FIRE is so that they will have the dunamis power that is needed to make them effective witnesses for Christ. Nevertheless, because too many of today’s believers have not received the infilling Holy Spirit, they are too weak and too powerless to fight against the devil’s strategies. Furthermore, these weak and powerless believers who are satisfied with what they already have, meaning they don’t want the infilling of the Holy Spirit, don’t want to speak in tongues, or don’t want to receive any other gifts of the Holy Spirit, sure enough will not be willing to drink any of the Holy Spirit’s new wine. The bottom line is that those believers who prefer today’s institutional (organizational) “church’s” flaky, shaky, powerless business-as-usual churchianity perpetrated by pastors and other spiritual leaders’ biblically unsound inclusive language spoken in their feel-good preaching and teaching no doubt will continue to resist the rocking of their religious boats until they end up sinking with their ill-prepared vessels. Put differently, as long as believers are not open to receive the Holy Spirit’s new wine, as long as they continue to refuse to drink from the Holy Spirit’s new wine (cf. 1 Corinthians 12:13b), they will not become spiritual winos; instead, they will continue to suffer from their spiritual sobriety condition, which is a minus rather than a plus.